Compared to other gangsters of his era very little is known about Ellsworth Raymond Johnson, better known as Bumpy. Born on Halloween in 1905 in Charleston, South Carolina, it is believed that even at a young age Bumpy showed signs of a short temper and a disdain for Caucasians, not surprising given he was growing up in the early 1900’s South. When he was 14 years old, realizing they couldn’t control him, his parents sent him to stay with his older sister Mabel who was living in Harlem. With the roaring twenties and prohibition about to begin and Harlem being the mecca for African Americans, there was no better place for Bumpy to showcase his talents. Upon his arrival, Bumpy was likely blown away by what he saw and one can only imagine the young criminal saw nothing but opportunity. Johnson hit the ground running and began building a fierce reputation amongst his peers and was known as a skilled street fighter, rarely, if ever, losing a fight. This, along with his fearless nature, leadership ability, and his high level of intelligence, made him a top prospect for the established gangsters in the neighborhood who were in the market for young toughs. Bumpy eventually became associated with highly prominent figure in the numbers game, Stephanie St. Claire also known as Madame St. Claire or Queenie, for whom he worked as an enforcer. Bumpy wrapped up one of his many prison sentences in 1932 and came home to find that things on the street were in a state of turmoil. With prohibition coming to an end, the Mafia, which was at its apex of power was looking for new sources of income and set its sights on the numbers rackets in Harlem. Their point man was the vicious Dutch Schultz who was a successful bootlegger and high ranking associate of the Mafia. He targeted numbers bankers and coerced them, mostly with the threat of extreme violence, to give up their operations. Bumpy decided he wouldn’t let it happen and stood up for Madame St. Claire and other numbers operators. He fought tooth and nail to keep the numbers rackets in Harlem and Black owned. The war lasted for three years until Lucky Luciano decided that Schultz was becoming more trouble than he was worth and had him killed. Luciano kept the operations Shultz had taken over in Harlem but made a deal with Johnson that those who had fought to remain independent would stay that way. 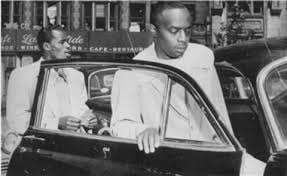 With that one deal Bumpy became a hero to all Harlemites and with good reason as no Black gangster had ever even come close to cutting a deal with the Mafia. Bumpy was the official king of Harlem and anybody wanting to make a move in Harlem had to go through him first. The Mafia also consulted with him on Harlem business. His star had risen and friendships with the likes of Sugar Ray Robinson, Billie Holiday, and other high profile celebrities were proof of that. Amongst his other criminal dealings, Bumpy dealt heavily in narcotics and was arrested and served time for the offense a few times. While his life was full of gun and knife fights, his death was much less dramatic. Bumpy passed away in his beloved Harlem at Wells Restaurants where he had just ordered a chicken leg, grits, and a cup of coffee. Bumpy simply collapsed and was pronounced dead shortly after at a nearby hospital. Bumpy was unique in many ways. He was highly intelligent and well read, traits that usually aren’t synonymous with a life of crime. He also loved his people and looked out for them buying them presents at Christmas and turkeys at Thanksgiving. When he sat down for a bowl of ice cream he made sure every child present had ice cream as well. Bumpy is the most important African American gangster in the history of the United States. None who came after were as powerful, organized, or ambitious. When Bumpy died, the king of Harlem title died with him. There has never been another man worthy of it.